The competition to renew the World Trade Center site ended with the recent announcement that Studio Daniel Libeskind got the job. Around the same time, another architectural competition for renewal drew to a close on the opposite coast. The Los Angeles Forum's Dead Malls Competition called for the redesign of malls that risked obsolescence. With malls as such major parts of the North American landscape, the competition is very forward looking and optimistic about a more efficient use of space. "We wanted to make a point about why all malls will fail," said architect Eric Kahn with the Central Office of Architecture in Los Angeles. "According to our diagnosis, malls have a reduced complexity to them, have only one theme, and are not useful for change." 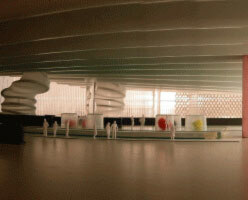 The Central Office of Architecture is one of the finalists in the competition. Their mall was designed to resemble the design of a city with multiple uses and diverse users. According to Kahn, the company wanted to win the competition using scenario planning--devising improvements for the future based on predicted needs. Their design is a multi-level smorgasbord of stores and businesses to attract a wide range of tastes. The first floor is a "big box cathedral" that caters to "gathering types" with convenient one-stop shopping at stores like Kmart and Costco. The second floor is geared towards wandering and browsing in a kasbah-style environment. In order to replicate a city, the design also leaves room for social interaction by cultivating the idea of a mall as a meeting place for groups that might be looking for a refuge. The mall would also be a mini city that never sleeps, with towers of restaurants, nightclubs and casinos serving the "raving culture." "Part of the mall would be a new emergent public realm where people could meet to talk about culture," said Kahn. "They have an instant city. There is the skating culture and hip hop culture here, and there is no place for these subcultures. This place would make room for that." The idea of a hub to exchange ideas was inspired by text messaging and wireless technology that can draw people together like a swarm of bees. In a recent tech incident, text messaging was used to spread news that Mariah Carey was on location in Tokyo. Within a short time, thousands of fans arrived at the scene. The finalists from Stoner Meek Architecture and Urban Design, based in San Francisco, stepped outside of the city for their inspiration to concentrate on greenspace, the original use for malls in thirteenth and fourteenth century Europe. 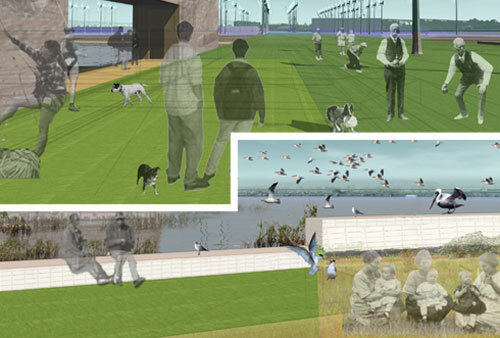 Inspired by Vallejo Plaza in California that borders a wetland, the team at Stoner Meek devised a plan to preserve the wetland as a backdrop for commercial initiatives. "All land should be healthy," said architect Jill Stoner. "One way or another, it should be supportive of life." 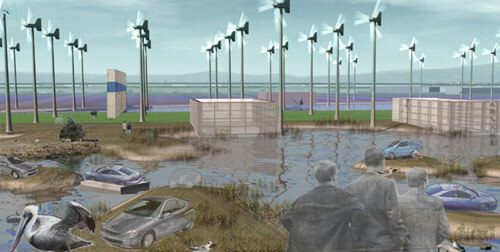 A car mall, consisting of island showrooms for ecological vehicles, would financially support the greenspace. In keeping with the ecological theme, the mall would also gather wind power to sell to surrounding areas. A visit to the Stoner Meek mall would happen along very different lines than at the local Gap. Mall-goers would pay admission fees to visit the lush wetlands. Stoner understands that this mall is not what shoppers might presently have in mind. "I think we are a couple of decades ahead," said Stoner. "People tend to be very conservative about these things and proceed cautiously. The visionary competitions put these things out there that, a few years down the road, might not seem so farfetched." Although the Dead Malls competition is presenting ideas that might not be directly compatible with present consumer demands, the reinvention of malls is already taking place. A 2002 report by the Solimar Research Group found that abandoned commercial space was creating opportunities for conversion to high-density housing. Caroline Dobuzinskis is a freelance arts and culture writer based in Ottawa, Canada.